...Photographic Ramblings...: Invitation to Imagine ~ Exploration Thursday! Invitation to Imagine ~ Exploration Thursday! I have been waiting to post this image for about a week now, and will be delighted to know what your reaction is. It's been quite sometime since I've been able to stretch my abstract skills while out on a countryside photo jaunt, and I was anxious to process this image most out of my last outing's results. I know most people find it difficult to interpret how they feel about abstract art or photography. Most see a bunch of shapes or colors or concepts that require some mysterious code to unlock their importance. But really, an abstract piece is simply a photographer's invitation to unleash your imagination for a bit, and allow yourself to step away from the practical. And it's inspired (at least for me) by something very real that caught my eye and seemed magical somehow. And then I simply strive to share my interpretation of that object or scene with all of you. Take a moment and decide what you might be looking at in the image above, before we continue. What I love about abstract images is that the underlying significance of the whole piece can simply be how light was reflecting off a tree, or how a close-up of a leaf out of context can look like a miniature landscape, or how a piece of rust can look prehistoric in a macro lens. It just begs you to put aside how you label what you see, and look for new possibilities. I find that exciting. For it seems like the imagination is rarely called upon during the daily grind, and even the imagination can get rusty from lack of use. The image above (which you know you can click on to enlarge) was the result of noticing the calm water along the shore before the St.Jacobs dam rushed along the river bed... and I began to look for interesting subjects in the shade since the sun was mighty strong that afternoon. 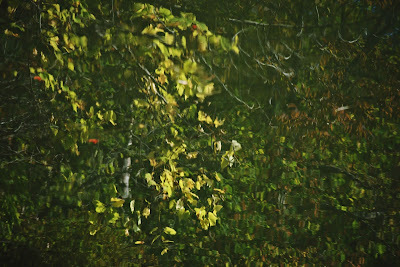 I zoomed in on the reflection of a Poplar tree several feet away, rising up through a tangle of brambles and over the water. 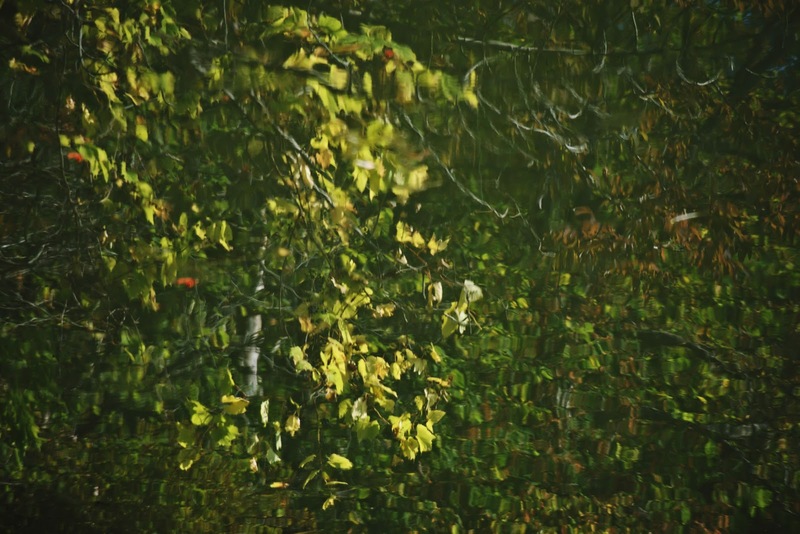 With my circular polarizer on the zoom, I was able to cut the reflection enough to see the form and color of the tree. I thought it looked like what a scene in a dream would look like if someone could step into it for a moment. You can see the odd ripple, and some blur, and it requires the viewer to determine if it was in the lens or if I processed it to look specifically like a reflection to begin with. It's just a reflection. I did some minor brightening to allow the dark details to be a bit more visible. That was it. It's a call to use your imagination folks. Don't make abstracts so complicated you can't enjoy them. It takes creativity to first capture it, and then the viewers ingenuity to really see and absorb. Thanks for the interpretive ramble! Have a super day gang! When Trees Are Enough ~ Mono Monday! Conveying Space ~ Mono Monday! Something from Nothing ~ Wide Angle Wednesday! Swept Away ~ Telephoto Tuesday! My Latest Project ~ The Notations Collection! Fading Beauty ~ Floral Friday! The Respectful Photographer ~ Telephoto Tuesday! Heralding in Color ~ Telephoto Tuesday! At War ~ Mono Monday!